This is a good Electronics project report on Autonomous Metro Prototype. It is a microcontroller based project which use 89s51. The project shows the design of a prototype of the small metro with auto show the station on the lcd display. This metro is run on the DC gear motor. With the help of this gear motor we slow down the speed of the vehicle to show all the function properly. It also tells the primary difference between a microprocessor and a micro controller. You can also Subscribe to FINAL YEAR PROJECT'S by Email for more such Projects and Seminar. The report contains the circuit diagram of metro rail prototype and complete microcontroller programming and LCD source code. 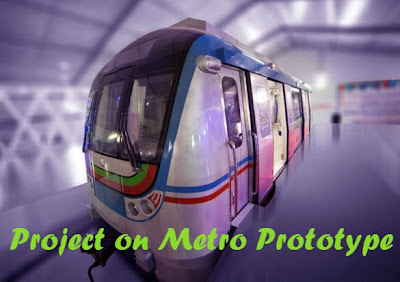 Some of the feature of this metro rail prototype are auto stop the train on few station, sensor base stoppage, auto braking in the front and in the back movement also, LCD display to show the station, auto reverse automatically, once you press the start switch train complete one cycle & voice announcement. Use this report for your help and reference work only.